Big Bear Tree Works is a locally owned and operated tree service company providing Southwest Virginia with professional, expert tree trimming, pruning, hazardous tree removal and stump grinding services. Big Bear Tree Works is not just a couple of guys with a truck and chainsaw. We are an expert tree service company consisting of a Certified Arborist, the proper equipment, training and experience to provide you with professional tree services. We understand how and where to prune or trim trees to promote proper health, beauty and growth of the tree. Our attention to detail, safety and clean up after the job is unsurpassed. If this is your first experience with hiring a tree service, be sure to visit our "Questions to ask before you hire a tree service" page. There you will find a great checklist of questions to ask and qualify your tree service as well as some things you may not have considered that could impact the health and beauty of your trees and prevent expensive problems in the future. Growing up in Botetourt County, Zac Turner has had an interest in nature, plants and the outdoors since childhood. He was taught that anything worth doing is worth doing right. This definitely shows in his attention to detail from the beginning of the job to the clean up. 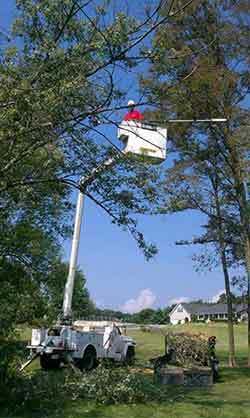 Read a few of his tree service testimonials to find out more. Zac is very active in his church, Daleville Baptist, and still finds time to travel with his family and church to go on missions for the deaf and less fortunate. In his spare time Zac enjoys kayaking and hiking. His sincere, humble and honest demeanor is a trait that is rarely seen these days.